Apple’s big iOS 7 update rolled out to devices yesterday, around 1 p.m. ET, and while many users encountered a lot of frustrating server errors trying to get it, the numbers show that a lot of people were successful in updating. Like, a whole lot. Mobile web and app analytics provider Mixpanel has been watching the iOS 7 uptake in real time, and has found that within the first 24 hours, devices running iOS 7 hitting its network reached 35 percent. The firm also found that many people updated during the workday (with 22 percent on iOS in the 10 hours following its launch), and that many more were updating late into the night Pacific time, with another 10 percent coming on between 10 p.m. and 8 a.m. PT. 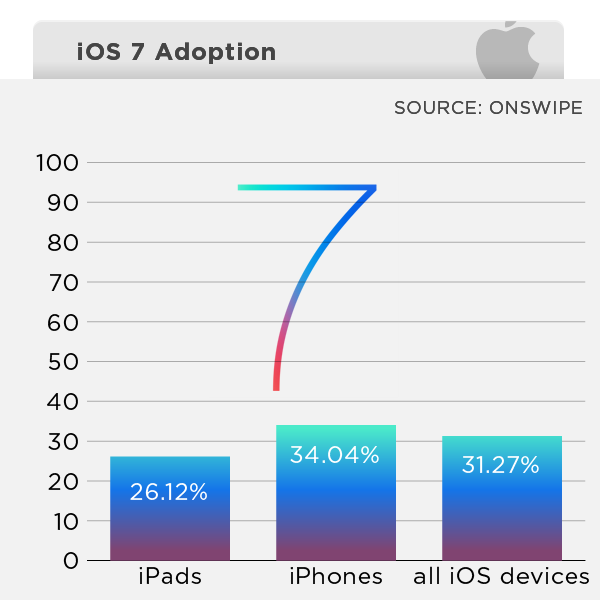 Predicting adoption based on the current rate, Mixpanel says iOS 7 could exceed iOS 6 activity on its network by this time tomorrow. Android, by comparison, still sees Jelly Bean (all versions) accounting for only 57 percent of traffic on the Mixpanel network, a full 450 days after the first version’s launch. Mobile and tablet website optimization company Onswipe has also been watching the numbers on its platform, and their sample size of around 1 million unique iOS devices reveals that around 31.27 percent of users are already on iOS 7. iPhone adoption is slightly ahead with 34.04 percent of total traffic coming from iOS 7, while on iPads visitors with the latest OS represent 26.12 percent of the pie. 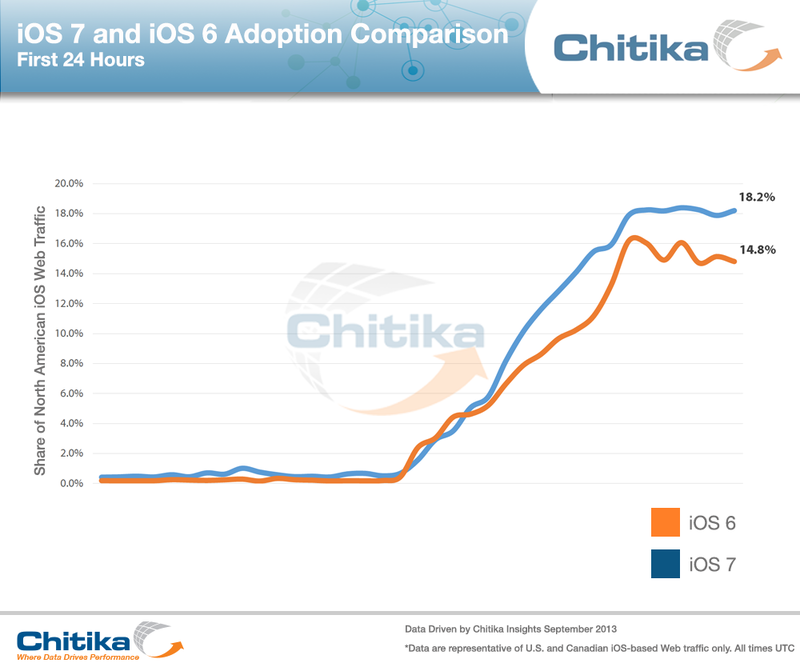 Both are up from last year and iOS 6, when 14.18 percent of iPads and 27.04 percent of iPhones had updated to iOS 6 24 hours in, making for a total of 24.77 percent of users across all devices. This adoption is definitely unmatched by any other platform and its updates, mobile or otherwise. Apple has a key advantage here not only because it issues updates over-the-air, meaning users can get them wherever they’re connected to a Wi-Fi network instead of having to tether to their computers, but also because of Apple’s unprecedented and unmatched relationship with its carrier partners. In short, Apple’s adoption rates aren’t suffering because of the big changes in iOS 7, as some had suspected, and in fact the shift seems to be drawing in a more eager crowd with a very healthy appetite for apps. We’re just a day into this, however, which means that so far the numbers could reflect an outsized portion of early adopters anyway. 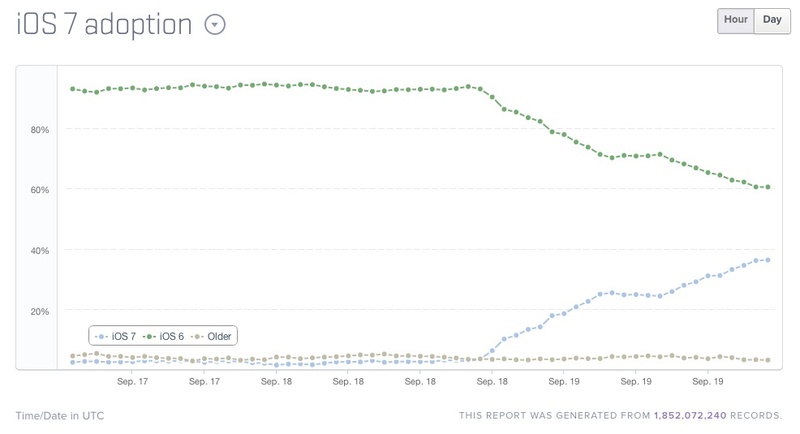 We’ll be watching these numbers to see if they continue to mirror or exceed previous adoption trajectories for new iOS updates, or if there’s any indication the wider public is more update-shy. Additional reporting by Matthew Panzarino.